Ibrahima Traore has found the key to success this season. The Guinean has used his quick feet and rapid acceleration to unlock the route to goal in a number of high-pressure encounters as VfB Stuttgart fight to secure their Bundesliga survival. And his performances have earned him a transfer to rivals Borussia Monchengladbach, who he has agreed on a four-year deal at the end of this campaign. Despite Stuttgart's difficulties, including financial issues that meant they could not afford to keep Traore, the 25-year-old winger has "developed incredibly well" according to the club's director of sport Fredi Bobic. He has certainly come along way since 2009 when he was stuck in Hertha Berlin's reserve side and had a reputation as someone who liked to party. Traore has turned his career around; his new-found professionalism and maturity are paying dividends. And when he takes up his new position with Monchengladbach he will be reunited with former Hertha coach Luicen Favre, the Swiss who handed Traore his senior debut in German football. Ex-Stuttgart player and current Under-16 coach Andreas Hinkel told BBC Sport: "I think Traore now feels free and has confidence. "He uses his speed and qualities so well. At the moment, he is very important for Stuttgart as they try to stay in the league and he has had a few assists recently." If Stuttgart manage to avoid relegation - and the fight may go all the way to a last-day clash away to champions Bayern Munich - Traore's impact will have had much to do with it. 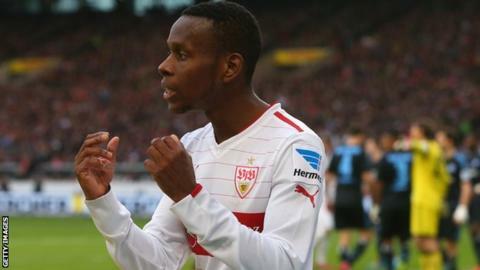 While Stuttgart have had three different coaches this season, Traore has benefitted from feeling settled in his life. Born and raised in Paris - he supported Paris St-Germain in his childhood - Traore admits that there were teething problems when he first arrived in Germany. But he managed to learn the language in seven months, teaching himself from a book, and has been further buoyed by his girlfriend's recent move to Stuttgart. These factors have given him stability off the field and contributed to his rich vein of form on the pitch. Having now made a total of 150 appearances for German clubs - Hertha BSC, FC Augsburg and VfB Stuttgart - the time is right for Traore to fulfil his potential. That would include achieving a better return in front of goal - he has scored only twice this season - to add to his overall record of 39 assists. With his blistering pace and nimble feet it is no surprise Traore has the ability to beat his man. Former Stuttgart boss Bruno Labaddia says Traore is "outstanding at dealing with one-on-one situations", while Stuttgart captain Christian Gentner describes the winger as a player who "looks for the dribbling opportunities - and if it doesn't work once or twice, he'll go and try a third time". Traore's size and physique look unimposing on first glance but he is an instinctive player who uses his pace and technique to great effect and knows when to dribble and when to pick out a team-mate. Gladbach hope he will add depth to a fast and fluid attack, which will also welcome Augsburg's highly-rated Andre Hahn in the summer, with the club aiming for Champions League football. Playing against the best teams in Europe would also hold Traore in good stead for Guinea as he looks set to become one of the key players in Michel Dussuyer's squad. Already he has reached 20 caps, scoring five goals and making nine assists, and Traore has set his sights high for the future. "When I see teams like Ethiopia qualifying for the World Cup play-offs, I think this is realistic for Guinea. We need continuity in the team - others that have this are gradually they are progressing," he told the Guineefoot website. And on a personal note, Traore believes he can be the driving force to lift Guinea to new levels of success. "There's no doubt I want to be the best player in Guinea and in Africa," he said.